Changing Your Identity with Hair Color: Are you ready for the challenge? Meet Tiffany. Tiffany has been one of my best friends for over 20 years. Tiffany is a blonde. I’m not using this as a discriptor as much as I am using it as a title. Tiffany is “A Blonde”. It’s her identity, philosophy and lifestyle. Two years ago we took her from a dimensional foiled blonde to a full on platinum blonde. She LOVED it. When she walked in a room you couldn’t help but turn to look at her. Blonde is an attention grabbing color. Why do you think so many Hollywood celebrities take on this look? Unfortunately, after two years of heavy lightening every three weeks, her hair surrendered. It couldn’t take the demand of such intense treatments. It weakened, and became damaged beyond repair. Tiffany had to make a decision: change her hair color or cut off the damaged ends into a short haircut. Both of which were the kiss of death to her identity. Here’s where the journey to her new identity began…. If Tiff couldn’t be platinum blonde, she wanted to find a new color that would still “pop.” She started to talk to me about becoming strawberry blonde like Nicole Kiddman. My concern with this choice was her skin tone. Tiffany has a pink complexion, and pink skin tones look best when complimented by cool colors. (Warm tones make the pink stand out more.) I also needed to make sure that my client and best friend understood that whatever choice she made, she would have to stick with it. Her hair was in no condition to handle re-lightening. Of course, explaining this is difficult. Since seeing is believing, I decided to take Tiff on a field trip to prove my point. I asked Tiffany to meet me at a beauty supply store that carries tons of wigs. Here we chose wigs of different tones of red for her to try on. It became immediately clear that strawberry blondes were a miss. They didn’t compliment her skin tone and they provided no “pop.” Then she tried on a dark cool cherry red. It was perfect! 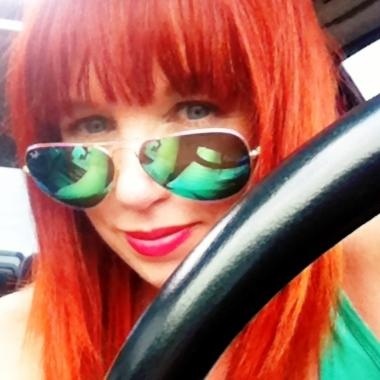 Initially Tiffany would have never thought to go from lightest blonde to this strong red, but getting to “test drive it” first gave her a whole new insight on the possibility. At my suggestion, Tiff bought the wig to take home so she could warm up to her potential new look. I checked in with Tiffany 3 days after the wig purchase to see how it was going. She had experienced mixed reviews from her husband and friends. 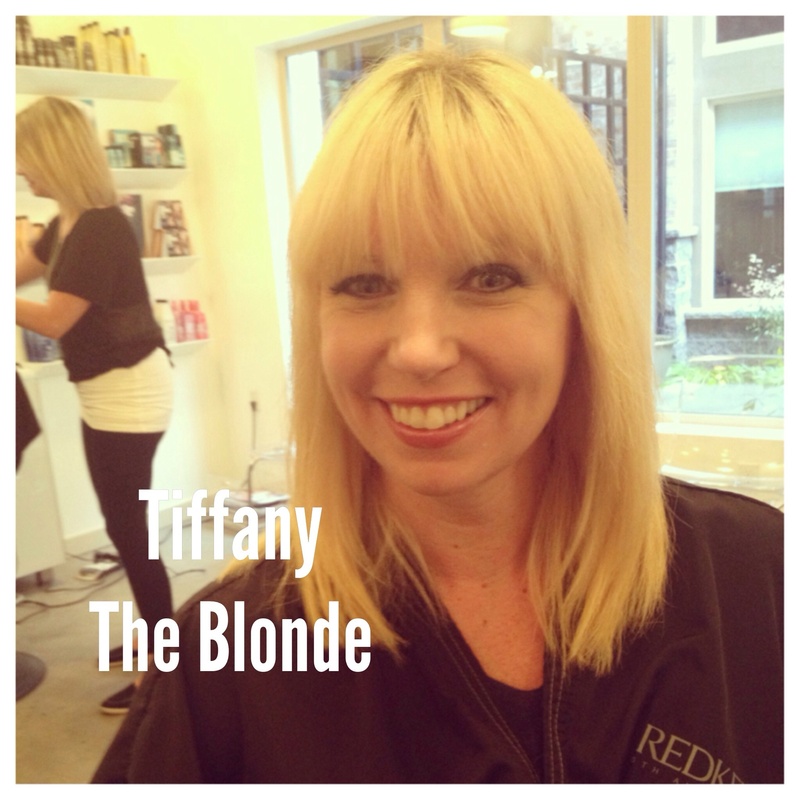 Remember, Tiffany’s blonde was a signature statement for her, so a new hair color not only changes the way she views herself, but also affects the way people see her. We discussed how it was important that she love the choice and to be ready for further mixed reviews. At the end of our conversation, she was ready to commit. Tiffany was going red! In an earlier post, I documented my client, Christin, going from brown to peach. 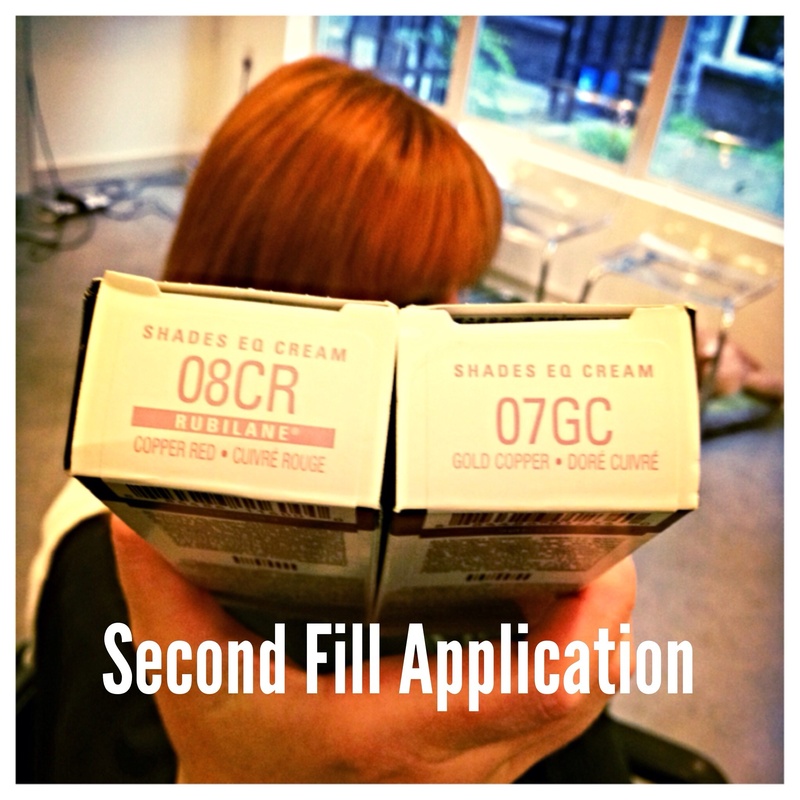 Christin and Tiffany’s processes both fall under a color correction service. Many times we see celebrities go through extreme color changes in what seems like overnight. I think it’s important to recognize the investment of time and money, as well as the value of working with a colorist who understand the importance of maintaining the hair’s health and integrity through this service. 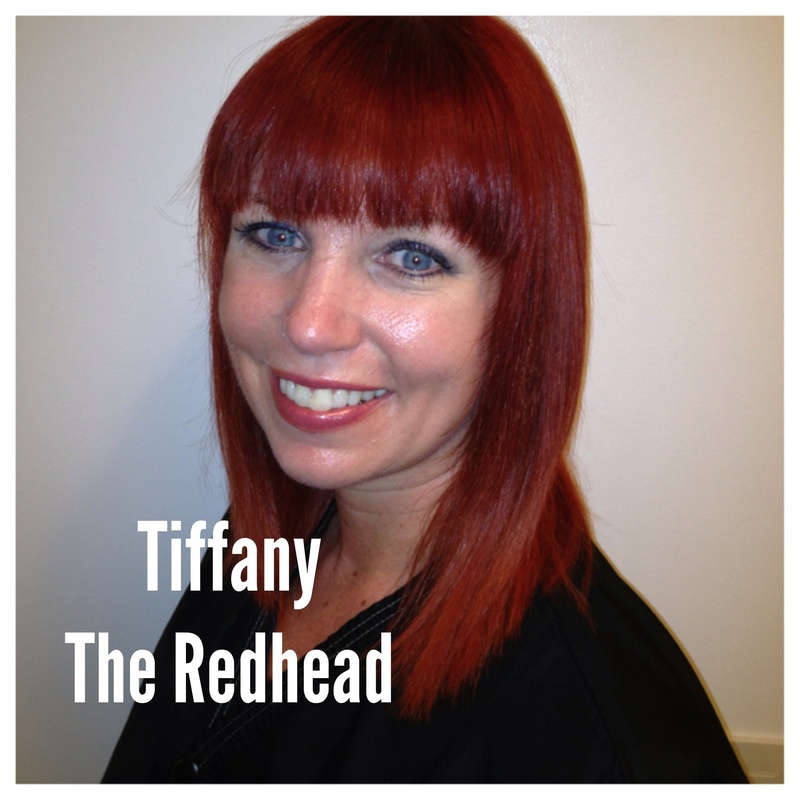 We took pictures of Tiffany’s entire journey to red so you could understand the process. Before we could apply any color, I performed two different protein treatments on Tiff’s hair. When hair has been extremely lightened, it needs protein to strengthen it. Additionally, the protein gives the color something to hold on to. If we skipped these protein treatments, the color would have a hard time looking dimensional and fall out in the first few shampoos. Redken CAT treatment was applied first, then followed by a Redken Chemistry Strength shot and sealed with a 3.5 pH spray. In the salon world we use numbers to refer to lightness and darkness and color as the tone. Our goal for Tiffany was to achieve a level 6 Red. If I applied a level 6 red on her blonde hair as the first color step, the end result would be flat, chalky and pink. This is because red needs yellows, golds, and oranges to give it vibrancy. To build these colors in the hair, it must be done in layers, a process we call “filling” the hair. 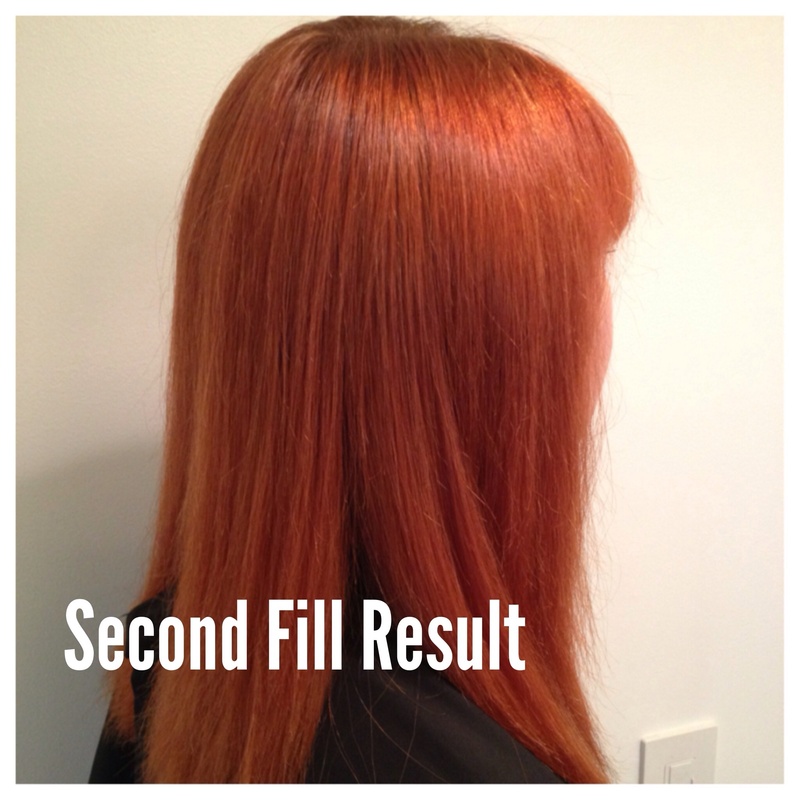 A fill formula is a color application designed to put base tones in the hair that will support the final color. Each layer is applied and processed like a traditional color application. 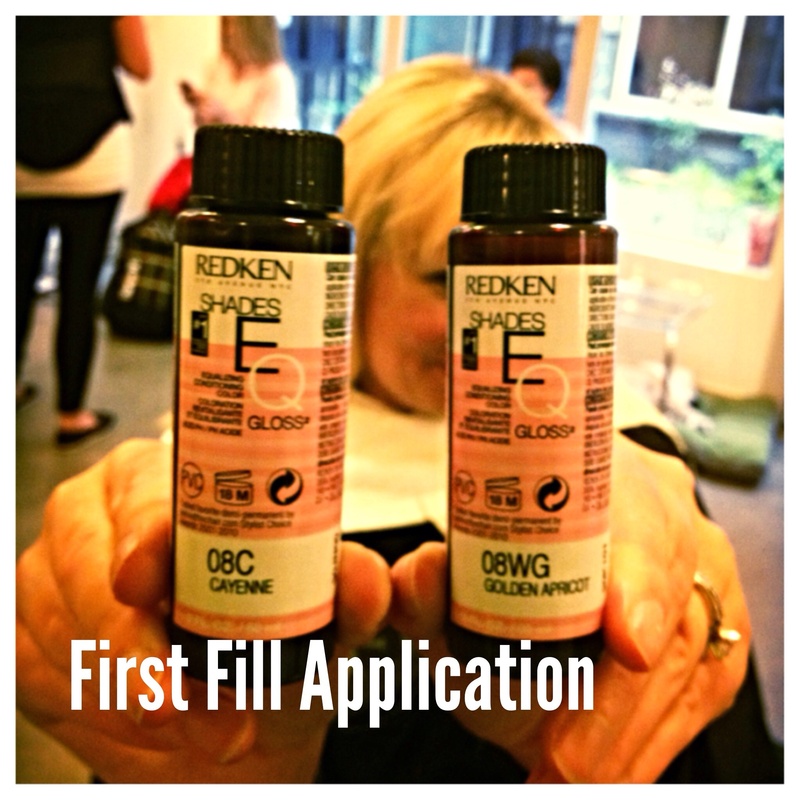 For the first fill, I chose a Redken Shades EQ gloss with copper and warm gold tones. After the fill formula processed for 20 minutes, I shampooed it and followed up with another protein treatment to continue to prepare the hair for more color. For the second fill formula, I chose more copper and gold tones with a little bit of red. Shades EQ cream was the perfect choice for its low alkalinity, but rich deposit. Are you seeing a pattern here? Protein is a big deal in color correction! After two fill processes, I had built up a warm base to support the final red color we wanted. 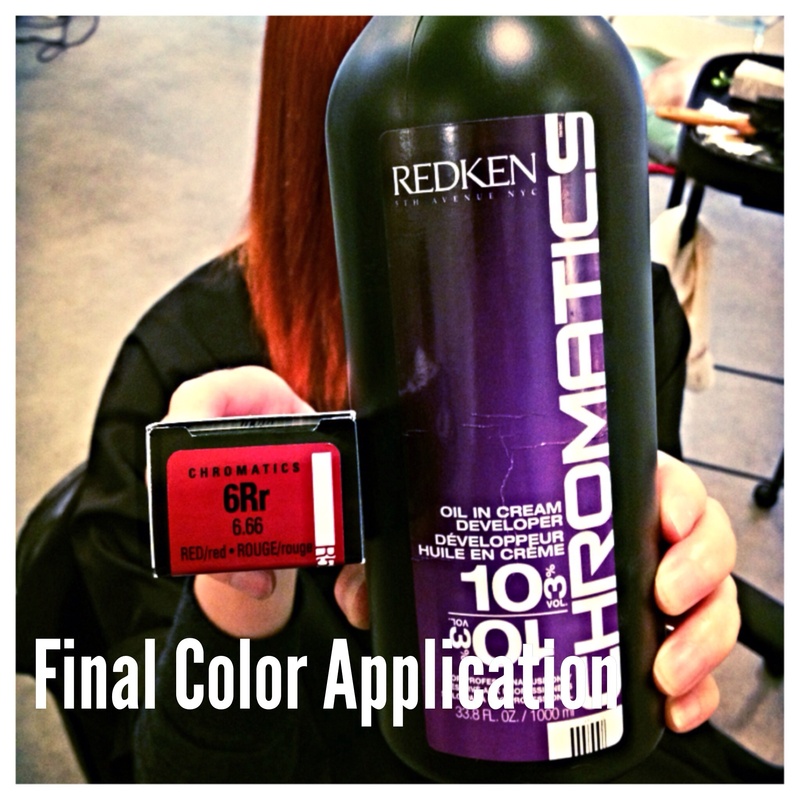 For the final formula I went with Redken Chromatics. This is a permanent color with no ammonia. That means is will give a rich deposit and is gentle on Tiff’s hair. Chromatics uses an oil delivery system which also helps to reduce future breakage in hair. I love the Reds in this line because they are strong, vibrant and dimensional. I applied the color from roots to ends and let it process for 35 minutes. For the last treatment, I blended protein with a color sealer to lock in Tiffany’s new hue. The end result: beautiful show- stopping red! This picture barely does the color justice. I added a second picture Tiffany took of herself the next day! Guaranteed to make you notice. Tiffany’s hair looked and felt amazing. It was worth every effort to get such a beautiful end result. Tiffany was so excited with the finished look. From start to finish, this was a 5-hour process. If I had skipped a treatment or fill, I would have sacrificed this awesome end color. For color correction services, I charge by the hour to ensure that every step is included. Changing your identity with hair color can be scary. If you are known as a striking blond, rich brunette or fiery red head, it can be life altering to you and those who know you when you make that change. Take the time to research what you want. Try on wigs in the color you are considering and work with an experienced colorist who can be honest with you about the expectations, maintenance, and end result. It can be one of your biggest and exciting life adventures. A transformed and gorgeous “redhead”!